Vaikunta Ekadasi is the Sukla paksha Ekadasi that occurs during the Dhanur month (when Sun transits Sagittarius or Dhanus Rasi) according to the Vedic Panchangam (Almanac). This corresponds to mid December – mid January in English calendar. Margasirsha sukla paksha ekadasi in lunar calendar is known as a ‘Mokshada Ekadasi‘. Vishnu Purana states that fasting on Vaikunth Ekadasi is equivalent to fasting on the remaining 23 Ekadasis in that year. Devas were unable to bear the tyranny of ‘Muran‘, a demon, approached Siva, who directed them to Vishnu. A battle ensued between Vishnu and the demon and Vishnu realized that a new weapon was needed to slay Muran. In order to take rest and create a new weapon, Vishnu retired to a cave named for the goddess Haimavati in Badrikasrama (Badrinath). 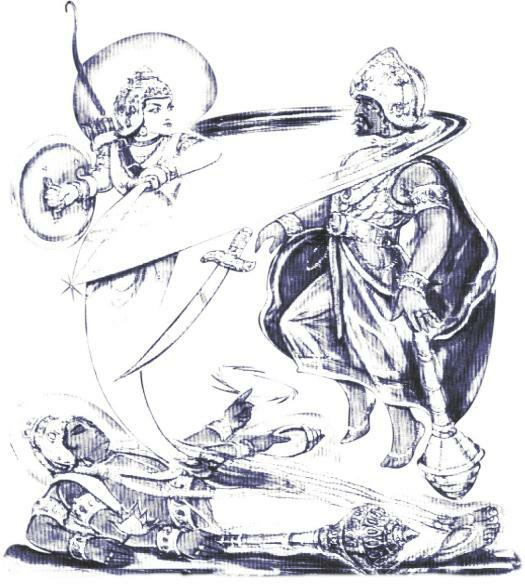 When Muran tried to slay sleeping Vishnu, a female power that emerged from Vishnu burned Muran to ashes with her glance. Vishnu, who was pleased, named the goddess ‘Ekadasi‘ (the day too was 11th lunar day in vedic month) and asked her to claim a boon. Ekadasi, instead, beseeched Vishnu that people who observed a fast on that day should be redeemed of their sins. Vishnu declared that people who observed a fast on that day and worshipped Ekadasi, would attain Vaikunta. That is how, the first Ekadasi, which was a Dhanurmasa Sukla Paksha Ekadasi. Vishnu Purana states that Lord Vishnu opened the gate of Vaikuntam (his abode) for two demons in spite of their being against him. They also asked for the boon that whoever listens to their story and sees the image of Vishnu coming out of the door, called Vaikunta Dwar, will reach Vaikuntam as well. Vishnu temples make a door kind of structure on this day for devotees to walk through. Demon Muran stands for the Rajasic and Tamasic qualities in people, attributed to lust, passion, inertia, arrogance etc. When one conquers these tendencies, one attains the purity of mind, Satva, indispensable for attaining of moksha, the liberation or realization of the self. For realizing the self as pure awareness, purity of mind is required. Fasting helps to keep at bay tendencies which could be triggered by intake of certain foods. Keeping vigil in the night is symbolic of awareness, or being watchful of the contents of the mind. When the mind is looked at, it becomes still. To abide in the stillness is to attain freedom or peace, acquired through merging of the mind with the self. This is symbolic of the mind automatically being absorbed at the sight of Vishnu after the arduous fast and vigil. There is a belief that rice or any other grain is prohibited, because Muran dwells in it. Symbolically, it signifies that the eating of rice makes one feel heavy and hampers the vigil. Entertaining negative tendencies could hamper one’s progress towards awareness or consciousness. Observance of the rituals on this auspicious day even without understanding their importance is beneficial. In the Mahabarata, Bhagavad Gita the conversation between Krishna and Arjuna at the beginning of Kurukshetra War also occurred on this day. Ekadasi tithi occurs on 11th day of each cycle of moon, when it forms trine with earth or sun. From this day moon’s influence on liquids in our body and mind starts rising. As long as important organs such as brain, digestive system function properly our body will never get any disease. All diseases start with indigestion. But from this 11th day our body gets into the magnetic pull of moon heavily and our digestive system doesnt secrete proper fluids that will help us digest our food. From this 11th day till 5th day after newmoon or fullmoon day, moon will influence us maximum and imbalance our digestive system. This will also cause decrease in brain’s functioning and cause weakness in memory, thought and decision making. On the day prior to Ekadasi (which is Dasami), we should take only lunch and skip dinner. Only fruits (without seeds) and milk can be taken during that night. We need to maintain a complete fast and engage in prayers and meditation of Vishnu. Strictly prohibited from taking anything cooked with rice and other grains like wheat, cereals, vegetables and fruits with seeds. That night, we need to keep vigil the whole night and visit the temple of Vishnu, mostly in the wee hours of the morning. Nirajala Ekadasi demands 24 hours of fasting without even drinking water or any other liquid. Also, should leave certain vegetables, such as tomatoes, cauliflower, eggplant, and leafy vegetables on Ekadasi. Spices, salts should also be avoided. Buttermilk, Curd or Yogurt, Coffee and Tea are also prohibited. Abrahamic religions have also adapted this concept of excluding rice, wheat etc grains during certain fastings. There are stories mentioning Adam, Eve and their daughters, how rice and grains carry SIN, how consuming it for the first time has started human digestion process etc.